Fly 2,600 miles, across 14 states in four days? Challenge accepted by Women in Aviation! 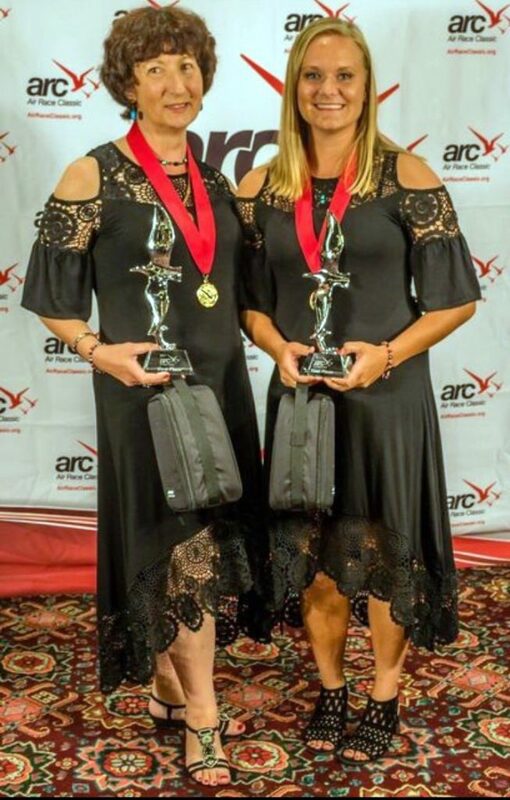 Zigzagging their way across the United States, two College of Aeronautics students and a recent graduate participated in the epicenter of women’s air racing – the Air Race Classic (ARC). “The Air Race Classic memorializes the first all-women’s air race in 1929 called the Women’s Air Derby. Twenty pilots, including Amelia Earhart, raced from California to Ohio,” said College of Aeronautics Associate Dean, Dr. Victoria Dunbar. 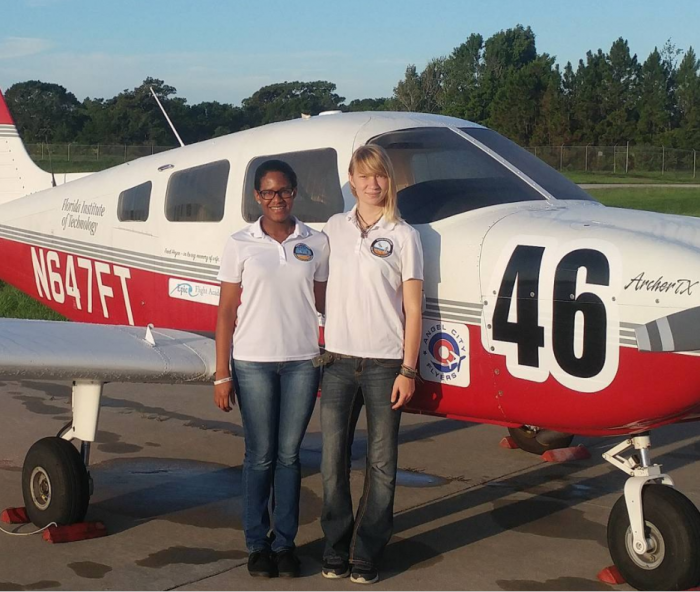 Chesapeake Gustin, a senior in aeronautical science with flight, and Sherisse Pierre, who graduated in the spring with her master’s in aviation human factors after earning a bachelor’s degree in aviation meteorology with flight, represented Florida Tech in the collegiate competition. McKenzie Krutsinger, a junior in aviation management with flight, also participated in the race. The 2017 event began in Frederick, Maryland, and concluded in Santa Fe, New Mexico. Two-women teams, flying only during the day, traversed a route of nine flyby timing locations. “To do the high speed flybys, we flew full throttle 200 hundred feet above the designated airport runways, either to the left, right, or directly over the airports along the route,” Gustin said. Dunbar was recruiting a student co-pilot to join Captain Judy Rice, founder of Think Global Flight and a key race organizer, on her team “Women of Diversity.” Gustin responded to the call. “After talking with professors and instructors at FIT Aviation, Dr. Dunbar selected me to be Captain Judy’s co-pilot,” said Gustin. However, when Rice was unable to participate, Gustin became pilot and needed to find her own co-pilot! Dunbar helped put her in touch with Pierre. The two were acquainted through the Women in Aviation Space Coast Florida Tech Chapter; however, they had never flown together. After one practice flight, they made their racing debut, and their event performance was strong—taking first place at the sixth timing mark and third place at the seventh mark. 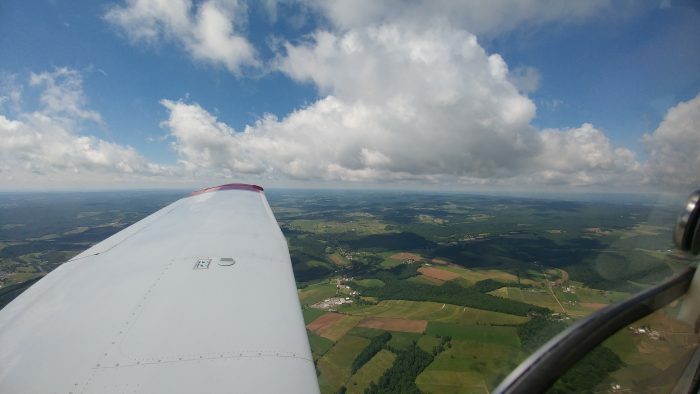 Gustin credits their success to previous flight training, decision-making skills, weather knowledge, crew resource management, physical flying skills and, of course, teamwork. Aviation management student McKenzie Krutsinger was at the right place at the right time. “Last summer when I was home for break, the Air Race Classic stopped at my home airport in Champaign, Illinois. As soon as I saw everything in action, I knew I wanted to participate,” said Krutsinger. Inspired by the experience and fellow women in aviation, Krutsinger started volunteering for ARC, where she met Dee Bond, a seasoned pilot from New Zealand. Just like Gustin, the journey for Krutsinger also began with an email. Once Bond returned home to New Zealand, she sent Krutsinger an email asking her if she would like to join her team as co-pilot for the next ARC. So before the cross-country race, they had to navigate the distance between them. “We spent the months before the race planning through email. Mostly dates of when things needed to take place or when deadlines for registration were. Closer to race day, we started planning our route, hotels and game plan,” said Krutsinger. Prior to the race, all the teams met to hammer out the final details of their plan. Weather was a hot topic among all the teams since it plays such a big role in the overall race performance. “In the days leading up to the race, we had many briefings about safety, weather, flybys and stops. We also talked about the weather. A LOT,” said Krutsinger. Their focus on weather paid off. Together, Krutsinger and her partner took home first place. “We had a tough go with some maintenance issues that hung us up at the start. So getting the opportunity to compete in the race and finishing it was enough for me. Winning was the cherry on top,” said Krutsinger. Surprisingly, only 6% of all pilots in the United States are female, which is why opportunities like the Air Race Classic are so important for inspiring the next generation of women in aviation. “The College of Aeronautics participates in many events each year that fosters women in aviation, in an attempt to increase this number. As a previous racer (2007, 2009, and 2011), I know that this is an amazing event to be a part of,” said Dunbar. The event is especially valuable to less seasoned, younger pilots who are able to meet and learn from women in aviation from different backgrounds and ages. “I learned so much from the different women there. The average age of the racers was around 46 years old. That’s amazing,” said Krutsinger. “If we can get at least one kid to walk away from that event and say “wow I want to be a pilot like these women” then we have done our job,” said Krutsinger. .